fully translated by mother tongue in : American English, Catalán , Deutsch, UK English, Español, Français, Italiano, Español Mexicano, Magyar, Nederlander, Srpski, Українcька (Ukrainian), Slovenščina, Polski, Българcки (Bulgarian), Suomi, Svenskapartial translation in: 漢語 (Chinese), Ελληνικά (Greek),日本語 (Japanese), עִבְרִית (Hebrew), Pyccкий (Russian). The English version of Eldy tablet is now available! 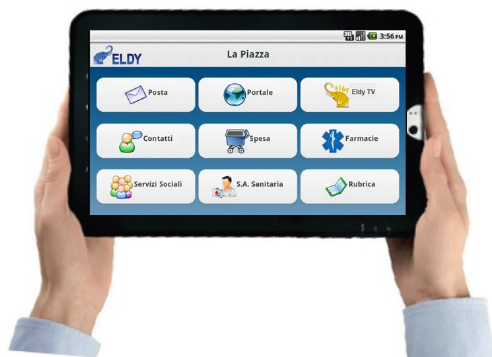 Go to www.eldy.eu/software/eldy-tablet/ to download it. If you want to use Eldy in a multi-user environment (e.g. library, guest house, netcafè, retirement house, etc): Eldy has multi user version suitable to these needs! Please contact us or download directly (but contact us and let us know your project).